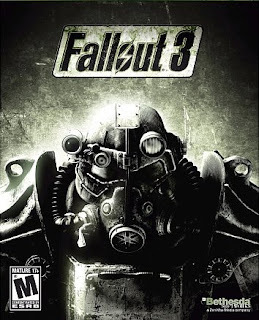 It was back in February that I first started playing Fallout 3: the next generation follow-up to the classic computer role-playing series of the late Nineties. I have been playing on and off since then, but in the past week or so decided to plow on through to... whatever the heck it was that was waiting at the end. A little while ago, after logging just over eighty hours of game time since then, I completed Fallout 3 at long last. By my calculation I could have wrapped everything up in about twenty hours, if I hadn't been such a fiend for exploring the Capital Wasteland (what the irradiated ruins of Washington D.C. are called almost three hundred years from now). And I still didn't get to scout out every location on the map! There's roughly 1/4th of the Capital Wasteland - almost entirely in the northeast quadrant - that I thought I'd be able to get to see somehow, until I got catapulted into the showdown with the Enclave at the Jefferson Memorial. Fallout 3 is an unparalleled achievement in video gaming. Never before had I known as much freedom and utterly vast territory to run around in. The story is solid, the characters are rich and well developed, and on a technical level the graphics, sound and programming alone will be a milestone by which games will be measured for many years to come. I also loved the voiceover work, especially Liam Neeson as James and Malcolm McDowell as President Eden. But the real star of Fallout 3 is the Capital Wasteland itself. Along with Rapture in the BioShock series, the Capital Wasteland is a character all its own. And I think that both Fallout 3 and BioShock have set a new definition for gaming excellence with their sheer geography: in my mind, this is the "virtual reality" that was so vastly hyped a decade ago. Chris, I am going to have to kill you. That, or make you play The Wicther to redeem yourself for loving this travesty of a game.